ARE WE ABLE TO SEE THE WORLD (UNIVERSE) UPSIDE DOWN? "As a man who has devoted his whole life to the most clear headed science, to the study of matter, I can tell you as a result of my research about atoms this much: There is no matter as such. All matter originates and exists only by virtue of a force which brings the particle of an atom to vibration and holds this most minute solar system of the atom together. We must assume behind this force the existence of a conscious and intelligent mind. This mind is the matrix of all matter." I was just curious, was he referring literally to the idea that all matter has a conscious mind in one form or another? or was he just trying to be clever? Is it actually possible for matter to be "intelligent"? Hubble telescope images of the different forms of star formation and the shapes of so called “Gas pillars” inside the star forming nebulae of the Milky-way galaxy, tell us the story of New Physics with unexpected results for the future of mankind. 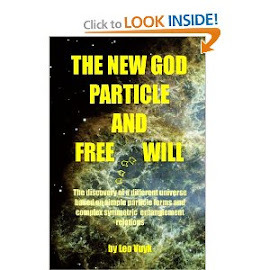 The story to be told in this book is based on numerous observations that potential Black holes -in contrast with mainstream physics- seem to repel all Fermions because they seem to repel all gas and dust particles! Gas and dust tails seem to push and accelerate these Black holes through the nebulae ! If this observation is right, then we are forced to assume, that the second Law of Thermo-dynamics is violated near "Black holes" and it will be a great job to find physical clues which support such a proposal. That in isolated systems, concentrated energy disperses over time, and consequently less concentrated energy is available to do useful work. What we observe inside the nearby star forming nebulae is that there seems to be lots of energy available to do useful work and accelerate countless “entities” through these systems. The violation of the second law. If we are able to find a solution for such a violation, then this is a sign of new physics and at the same time a possibility to describe unexplained energized x-ray point sources, such as all Quasar Hotspots, Sunspots, Herbig Haro Hotspots, Comets, Sunspots, and even Ball Lightning. If we look at the Carina Nebula, we may become a strong suspicion for acceleration phenomena, by recognizing pairing Black holes as the base for new Herbig Haro objects which are known as the origin of newly formed open star clusters. However we need to find the mechanism behind these pairing Black holes which leads us to a new interpretation of physics. After a long journey of research for this book, it came out that an extended model based on the non-relativistic “Bohm- Bell particle interpretation” of Quantum mechanics with additional real particle shapes, could do the job and explain most of the present anomalies in physics which are found on the macro and micro scale! The Bohm-Bell interpretation is described in Bell’s book: “Speakable and Unspeakable in Quantum mechanics” (Cambridge universal press, 1987) and recently discussed and supported in articles such as: “John Bell and Bell’s Theorem” (2004) by D. Dürr, S. Goldstein at all. However they failed to propose experimental differences with the standard theory to get a broad support from the physics community and the mathematical changes they proposed where not seen by the mainstream as a better alternative. This is described by Paul Davies and John Brown in “The Ghost in the Atom” described later in this book. In contrast with the Bohm-Bell interpretation, we propose in this book, that the Higgs vacuum is a dense network or lattice occupied by fast oscillating FORM changing Higgs particles and that Fermions are not “point particles” but real spinning propeller shaped particles able to make a SPIN-FLIP at the Black hole horizon and repel from it. Then we may have a logical foundation for violation of the second law of thermodynamics at the Black hole horizon. However, in that case, the vacuum is supposed to be a super dense God particle based particle system with a memory for speed and position of particles. In this book I will explain and describe several useful experiments to create a experimental based foundation for such a real alternative. The Venus-Mercury Radar reflection anomaly. The GPS incidental outlier anomaly. 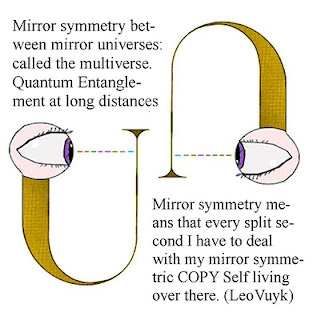 That new model is based on the unusual but most simple hypothesis for a new kind of Big Bang, together with the assumption, that our universe is STILL fully symmetric from the start in the form of a raspberry shaped multi universe, the "multiverse". The Big Bang should be interpreted as the Fractal evaporation of a Big Crunch Black hole, into an even set of symmetric and EPR related bubbles of copy universes.As a result, we live in a material bubble of the symmetric raspberry multiverse which is without time delay "entangled at a long distance" with the other (anti)-material copy bubbles. 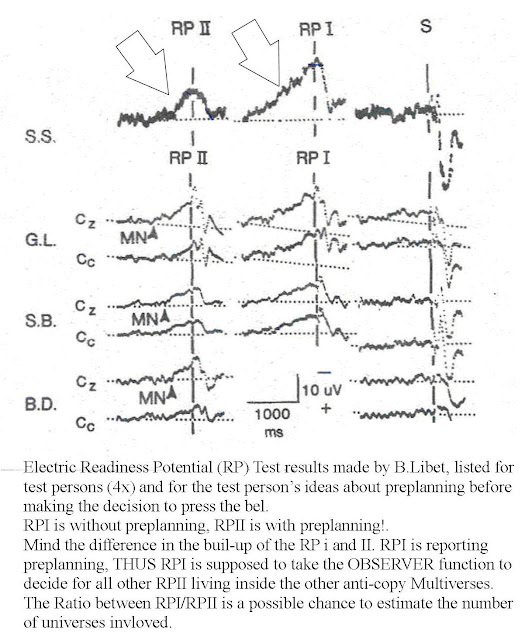 "EPR related" means that the particle system is based on the results of recent laboratory experiments originally based on the ideas of Einstein Podolski and Rosen (EPR). The EPR experiments demonstrated that particles that shared originally the same "identical state" remain instantly and enduringly connected, even at long distances like universal scales. This vacuum structure is supposed to be able to store all our individual thoughts ideas and actions., like a digital ROM, a programmable read only memory, coined STP_ROM, (Solar Toroidal Programmable Read Only Memory). More in detail: It is as if the Earth as a whole makes backup copies of itself every split second and leave these copies behind in the form of a ring around the Sun. Multiversal Consciousness, A shocking idea? the world upside down and doubled. We humans seem to be able to tap information (backwards) out of this digital memory as a base for all our dreams and intuition. More consequently, we are “forced” to constantly tap information out of this vacuum system, in the form of our dreams, creative intuition and even partly our human urges. Daniel Dennet described this effect as “Intuition pump”. Our social and moral behavior and habits are supposed to be influenced by this memory and as a consequence, the completion of this memory with its own Earth bound morality (good or bad) could be the ultimate goal of humanity as a local part of a much larger universal whole. 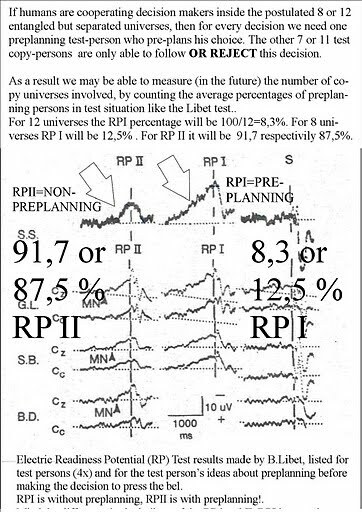 There is a small possibility yes, based on the existence of little deviations in the existing experiments made by Benjamin Libet and others. 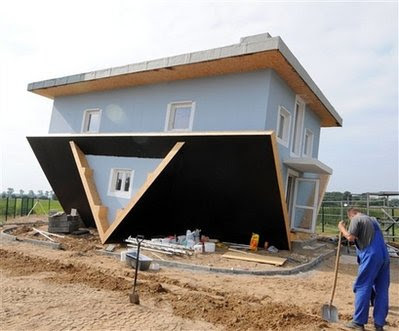 It is called "incidental pre-planning", which has got no scientific attention as far as I know. In a private letter, Benjamin Libet wrote to me, that he was not able to reproduce the statistics of these incidental pre-planning events of his experiments, because they where "Buried" in his computer files. 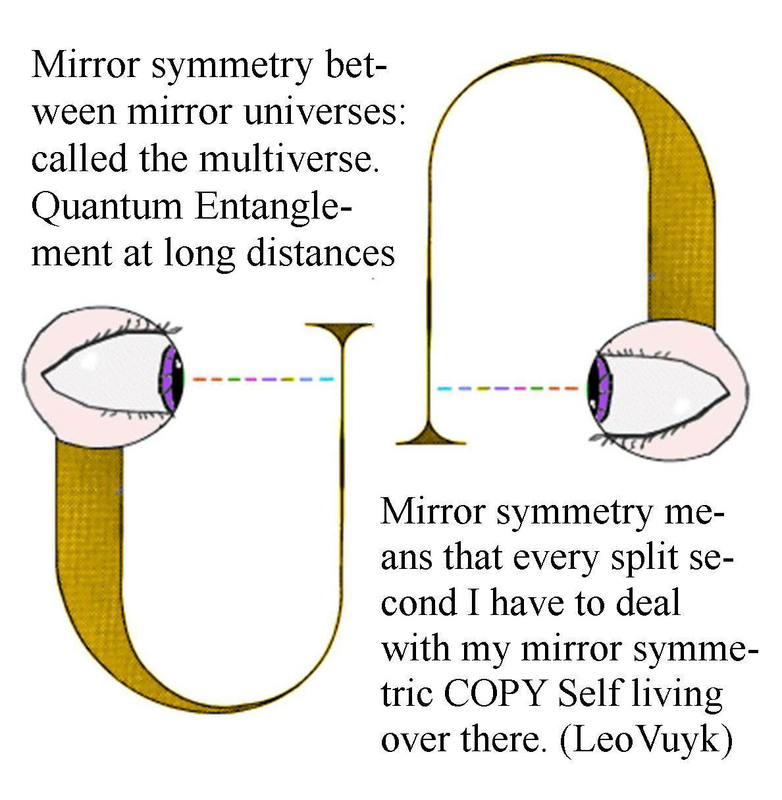 As a weird but logic consequence, this Libet experiment should be reproduced to find out about the percentages of "incidental preplanning" to be able to peculate about the exact number of entangled mirror-copy universes. As a consequence ENTROPY is decreasing around the horizon of a Black hole and the universe is served with Free Energy, or a "large scale Casimir effect" or "macro Casimir effect", the origin of quantum gravity and all non-Newtonian complexity in the universe like Cygnus A, the origin of so called Dark energy effects and perhaps in a downscaled form, even an alternative Free energy source on earth! If the second Law of Thermodynamics doesn't hold for "Dark energy" or “Dark Matter”, then the description of unexplained energized x-ray point sources, such as Sunspots, Comets and Ball Lightning, should be one of the highest scientific goals, to generate a firm alternative for fossil fuel. Introduction to my book, may 2008. Surprize: Quasars don't show redshift variation related to the accelerating expansion of the universe. 1: My FFF theoretical model predicts that quasars are black holes and as a consequence their light is gravitational redshifted by their own black hole graviitational field ( better vacuum distorion) instead of a distance related redshift! 2: Due to the poliferation of so many black holes located outside galaxies, redshift is in that sence related to distance by the continuous distortion of the photon trajectory to our telescopes. Supernovae show this "time dilation" in the speed at which they fade - far-off explosions seem to dim more slowly than those nearby. But when Mike Hawkins of the Royal Observatory in Edinburgh, UK, looked at light from quasars he found no time dilation.